GEORGE WASHINGTON. Newspaper. 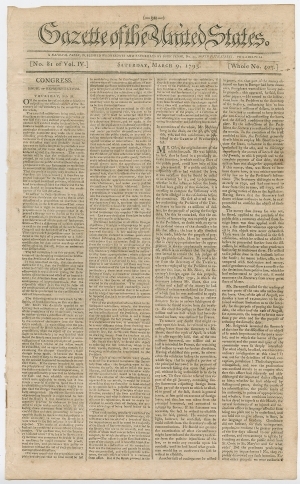 Gazette of the United States, March 9, 1793. Philadelphia, Pennsylvania: John Fenno. 4 pp., 9½ x 14¾ in. I AM again called upon by the voice of my Country to execute the functions of its Chief Magistrate. When the occasion proper for it shall arrive, I shall endeavor to express the high sense I entertain of this distinguished honor, and of the confidence which has been reposed in me, by the people of United America. 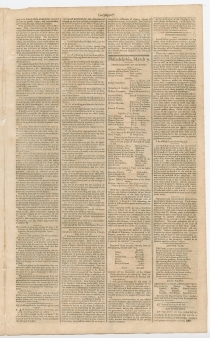 This issue also includes proceedings of Congress (p1/c1-p3/c1); a list of acts passed by the second session of the Second Congress (p3/1-2); a list of recent presidential appointments (p3/c3); contradiction of an early rumor of Thomas Jefferson’s intended resignation (p3/c3); prices current on a wide array of goods (p4/c1-2); and a variety of notices and advertisements. George Washington (1732-1799) was born in Westmoreland County, Virginia, and educated by private tutors. In 1749, he became a surveyor for Culpeper County, Virginia, and spent several years surveying land in western Virginia. Washington fought as an officer in the French and Indian War and the French captured him at Fort Necessity in 1754. He later became General Edward Braddock’s aide-de-camp, and helped rally the troops after Braddock’s death at the disastrous Battle of Monongahela. In 1759, Washington married the wealthy widow Martha Dandridge Custis, and they moved to his plantation Mount Vernon, where they raised her two surviving children. Washington was an innovative farmer, owner of hundreds of slaves, and emerging leader in Virginia’s planter elite. Selected as a delegate to the First and Second Continental Congresses, Washington was appointed General and Commander-in-Chief of the Continental Army when it was created in June 1775. After victory at Boston, defeat at New York, perilous winter encampments and many more battles, Washington accepted the surrender of Lord Cornwallis at Yorktown, Virginia, in October 1781. After the Treaty of Paris ended the war officially in October 1783, Washington resigned and briefly retired to private life. He served as a Virginia delegate to the Constitutional Convention in 1787, and the Electoral College unanimously elected him the first President of the United States in 1789 and again in 1792. His two terms set many precedents for the Presidency, and he exercised broad powers, appointing all members of the U.S. Supreme Court and establishing the new nation on a firm foundation with the assistance of his Secretary of State Thomas Jefferson and his Secretary of the Treasury Alexander Hamilton. He adopted an isolationist foreign policy, kept the nation out of the French Revolutionary Wars that engulfed Europe, and supported the controversial Jay Treaty. He supported Hamilton’s proposals for the assumption of state debts and the creation of a mint and national bank. He retired again to Mount Vernon in March 1797, but during the Quasi-War with France, Washington accepted a commission as lieutenant general from his successor John Adams and served as senior officer in the U.S. Army from July 1798 until his death in December 1799. 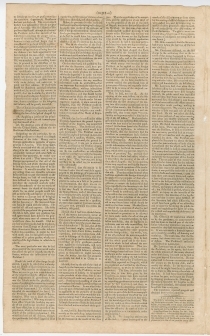 Gazette of the United States (1789-1793) was a semiweekly Federalist newspaper first published in New York City by John Fenno (1751-1798). It is often considered the most significant political newspaper of the late eighteenth century. In 1790, it followed the government to its temporary capital in Philadelphia. 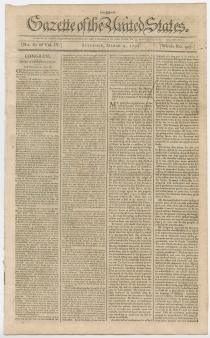 Early Acts of Congress and Presidential Pronouncements were often first printed in this newspaper, and it circulated to major cities where other Federalist newspapers copied freely from it. Among its pseudonymous contributors were Alexander Hamilton and John Adams. 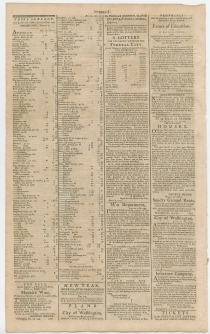 It continued under a variety of titles as a daily newspaper in Philadelphia from 1793 to 1818. After John Fenno’s death in the 1798 yellow fever epidemic, his son John Ward Fenno continued the newspaper until 1800, when he sold it.